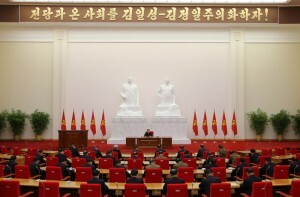 Pyongyang, April 14 (KCNA) — Supreme Leader Kim Jong Unmade the policy speech “On Socialist Construction and the Internal and External Policies of the Government of the Republic at the Present Stage” at the First Session of the 14th Supreme People’s Assembly of the Democratic People’s Republic of Korea on April 12. 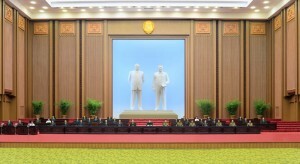 The First Session of the 14th Supreme People’s Assembly of the Democratic People’s Republic of Korea is convened at a time when the prestige and strength of our Republic advancing along the road of independence are being demonstrated to the full and its socialist construction has entered a very important period. As the election to the 14th Supreme People’s Assembly was held successfully amid the high political enthusiasm of all the people and with their active participation and the government of the Republic was reorganized, our State power has been further consolidated and the revolutionary advance of our people, who, united with one mind and will around the Workers’ Party of Korea and the government of the Republic, are marching confidently towards a higher goal of socialism, will be further accelerated. I extend my heartfelt thanks to all the Deputies for having placed, on behalf of all the people, great trust in me so that I would continue to lead the overall work of the State as Chairman of the State Affairs Commission of our glorious country, the Democratic People’s Republic of Korea; and I pledge myself to work with devotion for the development and prosperity of the Republic and the happiness of our people. Accomplishing the socialist cause under the unfurled banner of modelling the whole society on Kimilsungism-Kimjongilism is a great and historic task facing the government of the Republic. Modelling the whole society on Kimilsungism-Kimjongilism is the highest programme of our Party and the government of our Republic and the general direction and general goal of the construction of a socialist State. It is only when we thoroughly apply Kimilsungism-Kimjongilism to State building and activities that we can develop our Republic into the State of the great Comrades Kim Il Sung and Kim Jong Ilfor ever and creditably satisfy our people’s demands for and ideals of independence true to the will and wishes of the great leaders. The government of our Republic will achieve decisive victory in implementing the socialist cause by conducting more vigorously the struggle for modelling the whole society on Kimilsungism-Kimjongilism. The major fighting task facing us in our efforts for modelling the whole society on Kimilsungism-Kimjongilism is to accomplish the cause of building a powerful socialist country. Building a powerful socialist country is a historic stage in the struggle for achieving the final victory of socialism, and this can be accomplished with credit only by applying the Kimilsungist-Kimjongilist ideas of State building in a thoroughgoing way. The Kimilsungist-Kimjongilist ideas of State building contain in a concentrated way the ideas of, and exploits in, State building of the great Comrades Kim Il Sung and Kim Jong Il, who developed our Republic into the most prestigious and strong socialist State in its history; these ideas also indicate clearly the ways and means for accomplishing the socialist cause with the State government as a political weapon. With the great Kimilsungist-Kimjongilist ideas of State building as the immutable guiding principle, the government of the Republic should raise the country’s strategic position and national strength onto a new high and bring about a fundamental turn in accomplishing the Juche-oriented socialist cause. The revolutionary line of independence should be carried out in State building and activities. Independence is the political philosophy of our Republic, and it constitutes the core of the Kimilsungist-Kimjongilist ideas of State building. A socialist State can defend the country’s prestige and people’s destiny and build and perfect socialism as suited to its situation and by its own efforts, only when it maintains the principle of independence and the Juche-oriented stand definitely in all its activities. The great Comrades Kim Il Sung and Kim Jong Il raised independence as the life of the Korean revolution and the fundamental cornerstone for State building and advanced the revolution and construction in our own way while categorically rejecting worship of big countries, dogmatism and the high-handedness and pressure by outside forces. Under their wise leadership our Republic has been built and developed to be a socialist State, independent in politics, self-supporting in the economy and self-reliant in national defence, and it is still demonstrating to the world its prestige and might as a powerful independent country. Its strategic position and influence is being raised day by day as it recently achieved the historic cause of developing the two fronts simultaneously amid a do-or-die confrontation with the imperialists and is leading the trend of situation towards peace. Today the imperialists’ wilful violation of the sovereignty of other countries is growing more undisguised than ever before, and not a few countries are being forced into a miserable plight as they have no strength with which to defend themselves; in this world it is hard to find a country like our Republic that is steadfast in the principle of independence and assures the security of the State and the happiness of the people by its own efforts. Holding fast to the revolutionary line of independence in State building and activities is a consistent and immutable stand of our Republic. Geographically, Korea is sandwiched between big countries and its territory remains divided. Our Republic is conducting socialist construction as the hostile forces are resorting to more vicious schemes in trying to contain, undermine and stifle it. On the other hand, the contradictions and confrontations among great powers in their pursuit of hegemony are worsening on a regional and worldwide scale. Given the special circumstances of our revolution and the complexity of the present world situation, our Republic should build up its own strength from the firm standpoint of independence and seek independent development to defend its sovereignty and dignity and achieve true prosperity. In the past, too, when the world socialist camp existed and the countries concerned maintained cooperative relations to varying degrees, our Republic adhered to self-determination and independence in carrying on the revolution and construction, and promoted socialist construction on the principle of self-reliance. Building socialism by its own efforts according to the revolutionary line of independence is the basic principle our Republic must invariably maintain in State building. Whatever wind may blow and whatever challenges and difficulties may lie ahead, our Republic will, in the future, too, make no concession or compromise over the issues concerning the fundamental interests of our State and people. It will resolve everything on the strength of self-reliance and self-development, stepping up the building of a powerful socialist country in our own way and by our own efforts. A crucial factor in applying the revolutionary line of independence to the building and activities of our State is to strengthen the motive force of our revolution and develop all fields of social life in our own way. We should consolidate the country’s politico-ideological position rock-solid by fully equipping the people with the great Juche idea and the spirit of national independence and rallying them firmly behind the Party and the government of our Republic. The government will develop all realms of the economy, defence and culture from the steadfast Juche-oriented stand and in our own way, and it will never tolerate others’ way, others’ fashion, in the slightest. Our Republic has a bright, promising future ahead, as it is steadily developing on the strong basis of independence, self-sufficiency and self-reliant defence, with the Party and the people achieving solid unity to form the powerful motive force of the revolution. It is important to apply the people-first principle to the letter in all aspects of State activities and social life. This principle is a political ideal of regarding the masses of the people as masters of the revolution and construction, relying on them and making selfless, devoted efforts for their interests. It embodies the Juche-oriented revolutionary philosophy that the people are the most precious and powerful beings in the world; it reflects the unwavering commitment of our Party and the government of our Republic to love the people dearly and satisfy their demands and interests. The people are the roots of our socialist State and its foundation; they are responsible for developing it. All the activities of Party and government organs should be thoroughly oriented and subordinated to safeguarding and realizing the people’s demands and interests and faithfully serving them-this is just the way to promote the revolution and construction with success and bring the viability and advantages of socialism into full play. Maintaining the viewpoint and attitude of prioritizing the people in the activities of the State presents itself as an important matter, in view of the fact that abuses of power, bureaucratism and other violations of their interests may appear among officials in the course of socialist construction. The impertinent practices of lording it over the people and abusing the authority vested by them will impair the prestige of socialism and its people-oriented character, and weaken the people’s support for and trust in the Party and the State. They may end up threatening the very existence of our socialist system. With a view to carrying forward and holding up the ennobling ideas and intentions of the great leaders, who believed in the people as in heaven and devoted their lives to their interests, our Party defined the essence of Kimilsungism-Kimjongilism, the guiding ideology of our revolution, as the people-first principle and set it as the greatest priority to apply the Juche-oriented view on the people, a people-oriented philosophy, in the activities of the Party and the State. The slogan “Everything for the people and everything by relying on them!” encapsulates the people-first principle maintained by our Party and the government of our Republic. In all spheres of State and social life we have given top and absolute priority to what are oriented to the people and popular among them, unsparingly investing everything for their wellbeing. Over recent years our State has implemented gigantic construction projects in a bold manner. This is not because there is a surplus of funds in the country’s coffers; those projects are aimed at providing our people, who are the best in the world, with better conditions for a happy, cultured life. Our Party and the government of our Republic have resolutely declared a war against abuses of power, bureaucratism and corruption, which are infringing upon the people’s interests, and waged an intensive struggle against such practices, taking it as a matter with a vital bearing on the existence of our State. In the course of the endeavour to apply the people-first principle in all the activities of the Party and the State and in all fields of social life, the Party, the State and the people have formed a community in which they share the same destiny with one another; our Republic has advanced dynamically along the orbit of its development, never flinching in the face of unprecedented trials and difficulties. As socialist construction is progressing, we should direct closer attention to applying the people-first principle. Then we can double the dynamic for the advancement of our revolution and continue to demonstrate the advantages peculiar to our style of socialism, those which other countries cannot imitate. The Party and the State make selfless, devoted efforts for the good of the people, and the people support their Party and State whole-heartedly, entrusting their destiny and future entirely to the latter-these are the genuine features of our State embodying the people-first principle. The government of the Republic will invariably hold fast to the people-first principle as the core of its mainstay, and strive to hasten the bright future of socialism aspired after by the people by relying on their strength. Party leadership over the overall affairs of the State should be provided in every way possible. Party leadership is the intrinsic requirement of the building of a socialist State and lifeline of its activities. Only under the leadership of a party, the incarnation of the demands and interests of the masses, can the socialist State perform its mission as their servant with credit and properly organize and undertake unified guidance over all realms of social life and all regions and the overall socialist construction. A socialist government, not led by a revolutionary party, will lose its intrinsic nature and fall prey to the reactionaries and plotters, with the result that its people cannot escape the pitiful plight of a political orphan. Our Party is the veteran and seasoned General Staff of the revolution, which has gained rich experience and outstanding leadership skills and abilities in the course of leading the several stages of social revolution and socialist construction. What instils boundless dignity and confidence in sure victory in our people is the leadership of our Party, which is bringing about world-startling, miraculous achievements one after another while leading the gigantic campaign of creation for building a powerful socialist country amid acute confrontation with the hostile forces. Party leadership over State activities should be consistently based on political guidance, policy-oriented guidance. The Party is the guiding force that provides guidelines to be followed by the socialist government and guides all State activities so that they are properly conducted; the State is the executor and performer of the Party’s lines and policies. Proceeding from these interrelations between the Party and the government, our Party has shown close concern over encouraging its organizations to exercise unified control over the affairs of their sectors and units and give political and policy-oriented guidance over them in the efforts to materialize its leadership over State activities. If the Party, a political leadership body, is involved in the administrative work and resorts to technical methods, it will not only deviate from its main principle but paralyse the functions of administrative organs and impair its authority, ending up making a mess of the revolution and construction. At present, the government of our Republic is satisfactorily effecting unified leadership over the State and society by relying on the revolutionary guiding ideology and scientific strategy and tactics advanced by the Workers’ Party of Korea. In the future, too, it should remain faithful to the Party’s ideas and leadership, so as to perform its missions of representing the rights of the masses of the people to independence, organizing their creative abilities and activities, taking care of their lives and protecting their interests. When it strictly adheres to the ideas and principles of building a socialist State elucidated by Kimilsungism-Kimjongilism, our Republic will be built more splendidly as an independent powerful State that no one can dare provoke, a people’s State in which the people’s ideals are fully realized and a great State that leads the world by giving full scope to its unlimited potential for development, and the victory of the socialist cause will be brought closer. The central task facing our Republic at the present stage of the struggle to build a powerful socialist country is to solidify the material foundations of socialism by concentrating all national resources on economic construction. Economic self-sufficiency is a material guarantee and prerequisite for building an independent State. Only by relying on independent and strong economic capability, it is possible to defend the dignity of a State and increase its political and military might on a steady basis. The present political situation demands that our State hold higher the banner of self-sufficiency and self-reliance. Recently, the United States has grown fearful of the threats posed by our rapidly-developing nuclear armed force to the security of its mainland. At the negotiating table, it has made much ado about improved relations and peace; on the other hand, it is resorting to all conceivable schemes in trying to prolong the economic sanctions, with the aim of preventing us from following the path of our own choice and disarming us first to create conditions for realizing its ambition of overthrowing our social system. Now that it is raising demands that run counter to the fundamental interests of our State, as a prerequisite for lifting the above sanctions, the confrontation between our country and the United States is bound to be drawn out and the hostile forces’ sanctions will persist. We have built socialism in the face of their constant sanctions, but we must neither become accustomed to this nor slacken the speed of advance of our revolution. To the forces who cannot thwart us by force, sanctions are a last resort. However, these are an intolerable challenge to us; we must never connive at or remain indifferent to them, but act resolutely to frustrate them. As we put an end to the prolonged nuclear threat by dint of nukes, we must frustrate the hostile forces’ sanctions on the strength of self-sufficiency and self-reliance. We have the capabilities and foundations for independent development to revitalize the national economy and raise it to the advanced international level in the shortest possible period. The foundations of our self-supporting economy that have been laid for several decades, able scientific and technical personnel, and the creative strength of the heroic people who have made self-reliance part of their mental qualities and are brimming with patriotic enthusiasm-these constitute our valuable strategic resources. By making the most of these enormous and unlimited potentialities, we must create another legendary tale of world-startling, miraculous successes and go ahead of others by making a greater leap forward. When we adhere to the line of building an independent national economy and give full play to the revolutionary spirit of self-reliance, we can achieve remarkable development with a strength that others can neither fathom nor imagine. The strategic policy pursued by our Party and the government of our Republic in promoting socialist economic construction is to make the national economy Juche-oriented, modern, IT-based and scientific. The independence and Juche character of the national economy should be consolidated in every way possible. We must strive hard to achieve self-sufficiency in power, fuel and raw materials, which constitute the basic guarantee for independent economic development. The electric-power industry should maintain and strengthen the existing bases to maximize the production of electricity, put power supply on a scientific and rational basis, and actively develop the hydraulic, tidal, atomic and other promising sources of energy so as to create greater generating capacity. Coal and other mines, which are in charge of the primary front for economic development, should give precedence to prospecting and tunnelling, and concentrate their efforts on realizing mechanization of extracting and transport, thus extensively increasing the production of coal, the food of industry, and minerals. The metallurgical industry should establish a new modern yet large-scale iron production system that suits our actual situation by solving the scientific and technological problems arising at the Juche-oriented iron production bases and operating them properly. The chemical industry should turn itself into a Juche-oriented, energy- and labour-saving industry that totally relies on locally available raw and other materials. By doing so, it should meet the domestic demands for fertilizer, chemical fibre, synthetic plastics and various other chemical goods. The problems of food and consumer goods, which are of decisive importance in the improvement of the people’s living, should be solved in the earliest period. The agricultural sector should pay special attention to solving the problems of seed, fertilizer and water and securing the land under cultivation, introduce scientific farming methods and raise the rate of mechanization of farm work, and thus attain without fail the grain production target set by the Party. The stockbreeding bases such as chicken and pig farms should be modernly built or renovated, domestic animals be raised in a scientific way, and a mass movement be launched to raise grass-eating animals perseveringly. Also, a turn should be made in the production and processing of seafood by consolidating the material and technical foundations of the fishing industry. The light industry establishments should hold fast to recycling as one of their strategies, along with the strategy of relying on locally-available raw and other materials, step up modernization of their production lines and invest great efforts in developing new products. In this way, it should ensure that larger amounts and various kinds of quality consumer goods are supplied to the people. We should carry on grand construction projects more vigorously to provide the people with more affluent and cultured living conditions. The construction sector should make innovations in architectural designing and construction method and improve the level of technical equipment of construction units to build world-class architectural structures in a larger number. The building-materials industry should build up the capacity of cement production and decisively raise the proportion of domestically-produced finishing materials. The transport sector should adopt revolutionary measures for improving rail and water transport in conformity with the actual conditions in our country and resolve the problem of passenger transport in the capital city and provincial seats in our own way. We should improve the structure of the national economy still further, develop all its branches in a harmonious way and secure the international competitive edge in the magnesia and graphite industries and other promising economic sectors. We should make proactive efforts to put the national economy on a modern and IT footing so as to transform the country’s economy definitely into one that is knowledge-based. We should work out strategies and targets for developing hi-tech industries including the machine-building, electronics, information, nanotechnology and biological industries, and concentrate investment on them. Every sector should build a parent, standard factory in which science and technology are integrated with production and all production lines are made remote-controlled, intelligent and fully automated and generalize its experiences, so as to raise the overall economy to the advanced level of the world. We should develop the local economy and reenergize the external economic work. Provinces, cities and counties should build and develop the economy with their own distinctiveness by giving full scope to their natural and geographical advantages and properly sustaining their economic, technical and traditional characteristics. The State should empower the local authorities to stand on their own feet and develop by themselves, and adopt relevant practical measures. The external economic sector should conduct external economic cooperation, technical exchanges and trading activities in a multifarious, proactive and tactical way on the principle of strictly abiding by the line of building an independent national economy and in the direction of reinforcing the fields and links essential in strengthening the country’s economic foundations. In order to give full play to the potentials of the self-supporting socialist economy, comprehensive measures should be taken to enlist all the human and material resources and potentialities of the country in a coordinated way and utilize the new elements and driving force for economic development. The economic work of the country should be conducted under the State’s unified control and supervision, and in accordance with its strategic plan and command. We should adopt a scientific and practical strategy and phased plans for the economic development of the State and execute them without fail. The structural and work system should be adjusted so that enterprises can arrange and conduct production and management activities smoothly while fully satisfying the needs of the State’s unified guidance over and strategic management of the economic work. The State’s institutional and legal conditions and environment concerning economic affairs should be improved and an iron discipline be established so that the economic organs and enterprises give priority to the national interests and the promotion of the people’s wellbeing and observe the law and order strictly. We should further improve planning in compliance with the essential requirements of the socialist economy and deal with pricing, monetary and financial matters-the important links in the whole chain of economic management-in accordance with the economic principles and laws and in such a way as to reap profit in reality. By so doing we can encourage the enterprises and producers to work with great interest and high enthusiasm. Measures should be taken to conduct the economic management on the basis of scientific calculation so that optimum results can be obtained. Raw and other materials, funds and manpower should be economized as much as possible and the expenditure be made cost-effective so that all the resources of the country may contribute to the development of the State to the maximum. The main force that propels a self-supporting economy is the talented personnel and science and technology. We should make it part of the national social practices to attach importance to the talented personnel and science and technology, identify and appoint the talented personnel to the appropriate posts so that they may lead production and the development of technology; and we should steadily increase State investment in the field of science and technology. We should make proper decisions on major scientific and technological tasks and projects, strategic, pivotal, profitable and economically important, and concentrate our forces and funds on them to ensure that science and technology may render decisive services to reenergizing the overall economy and developing the hi-tech industry. We should build up the political and military might of our Republic. Our political and ideological might is based on the advantages and stability of the political system of our socialist State. We should substantially provide all the people with genuine political rights and dignity and give full play to the political and ideological advantages of our system, in which the whole country, united in ideology, purpose and moral obligation, makes uninterrupted progress. The government of the Republic should regard the people’s interests as the absolute standard and give the first consideration to their will and desire in formulating and carrying out its policies; in this way, we can encourage the broad sections of the working masses including workers, farmers and intellectuals to take active part in the management of the State and society as befits the genuine masters of State administration. The government should give definite precedence to the political and ideological work as required by the intrinsic nature of the socialist society, so as to train all members of society as true advocates of Kimilsungism-Kimjongilism and further consolidate the political and ideological unity and cohesion of our State. The government of the Republic should perfect the legal system of the State and intensify the role of law in State and social life. The laws of the Republic are powerful weapons for defending the gains of the revolution, consolidating and developing the socialist system and championing and guaranteeing the people’s rights and interests. In keeping with the intensification of the revolution and construction, the laws and regulations should be subdivided and specified on the basis of the requirements of the Party’s policies and in reflection of the prevailing realities so as to legislate and perfect them in a scientific way; they should be modified and supplemented in good time, so that they can reliably guarantee the administration of the people-oriented politics of the socialist State. It is necessary to thoroughly establish a habit of observing the socialist laws throughout society so that all the people respect the State laws with a noble sense of law observance and abide by them on a voluntary and obligatory basis; law-enforcement organs should enhance their role, never allow double standards of discipline in enforcing laws and strictly adhere to scientific accuracy, objectivity, impartiality and prudence in applying laws; in this way, we should turn ours into the most advantageous socialist law-governed State in which laws safeguard the people and the latter observe the former. The self-reliant defence capability is a powerful and valuable weapon for defending the sovereignty of our Republic. The peace-oriented atmosphere that has begun to be created on the Korean peninsula is not stable, and the hostile forces have not given up their attempt to invade our Republic. Always keeping in mind the iron truth that peace can be guaranteed only by powerful military strength, we should hold fast to the principle of self-reliant defence and keep building up the country’s defence capability. 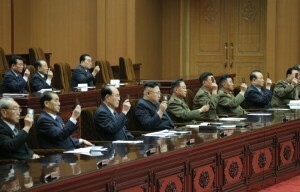 The government of the Republic will provide, on a preferential basis and in full, the human and material resources necessary for strengthening the People’s Army, arming all the people and fortifying the whole country, and steadily raise the national defence capability by putting the defence industry on a highly Juche-oriented and modern footing. Socialist culture should be developed in our own way. It is important to create a climate of giving top priority to education throughout the country and bring about a radical improvement in education in our own way so as to overtake the developed countries in the educational level. The educational sector should strengthen the ranks of teachers, improve the quality of education as demanded by the trend of developing modern education, and thus train larger numbers of talented personnel who will shoulder the scientific and technological development of the country and socialist construction. Upholding the slogan of making all the people well versed in science and technology, we should enrol all the working people in the study-while-you-work system and prepare them as intelligent workers. The government of the Republic should give special attention to the socialist health service. It should further improve medical service, raise medical science and technology to the cutting-edge standard and consolidate the material and technical foundations of the health service sector, thereby bringing greater benefits of our country’s socialist healthcare system to the people. The sector of culture and arts should create larger numbers of masterpieces that represent the demands of the times and aspirations of the people, and the sector of cinematic art, in particular, should kindle the flames of effecting an upsurge in film-making in the new century, thus playing the role of pacesetter in opening up a new heyday of the development of socialist culture. Sports play a very important role in consolidating a nation’s strength and exalting its resourcefulness and prestige. A nationwide effort should be directed to developing sports science and specialized sporting techniques and organizing the mass-based sports activities on a wide scale. At the same time, sports facilities should be increased in number and the existing ones renovated with an eye to satisfactorily hosting even international games. Establishing a socialist way of life and moral discipline is a severe political struggle and an acute class struggle to safeguard and add lustre to our ideology and system. We should encourage all the members of society, with a high sense of pride and self-confidence that our culture, our way of life and our morality are the best, to give full play to the collectivist way of life and moral traits and actively create and fully enjoy the revolutionary and optimistic cultured way of life of our style as suited to the aesthetic sensibilities of today that aspire after cultural development. We should firmly defend the ideological and cultural position of our State by strictly guarding against any slightest expression of immoral and alien phenomena that poison the people spiritually and degenerate and debase society, improving ideological education and struggle and intensifying legal sanctions against them. In order to successfully carry out the enormous revolutionary tasks facing the government of the Republic, people’s government organs should enhance their functions and roles. They should further intensify their unified guidance over the whole society as required by the developing revolution. They should consolidate and develop the socialist political system and carry on the work of accelerating economic and cultural construction. In particular, they should give precedence to economic work and concentrate their efforts on improving the people’s living standards. They should put every realm of social life and every region under their supervision and provide unified guidance over them while giving free rein to the creativity of individual sectors and units. People’s government organs should establish the trait of making selfless, devoted efforts for the good of the people as appropriate to their basic duty. They should always pay heed to the people’s opinions, plan and organize their work in reflection of their demands, find what can be done for them and carry it through to completion, and enlist them in carrying out the Party’s lines and policies. They should give top priority to the people’s interests and comfort and take responsible care of their living. Kim Jong Il pursued invariably even in the most trying days, so that the people can feel keenly the gratefulness of the socialist country in their daily life and turn out in the efforts for achieving its prosperity. People’s government organs should maintain it as the iron rule to work only under the Party’s leadership. They should organize and carry on all work with the Party’s ideas and policies as the yardstick, proactively defend the Party’s policies and implement with credit the revolutionary tasks advanced by the Party, thereby giving full play to the validity of our Party’s policies. Party organizations at all levels should intensify collective guidance over the activities of government organs in conformity with the demands of the developing revolution and actively encourage all their officials to perform their responsibilities and basic duties for the revolution. Officials of people’s government organs at all levels should enhance their sense of responsibility and roles. The present stirring realities urgently demand that our officials take the lead in the general offensive and wage a vigorous struggle in order to discharge their duties as befits the leading personnel of the revolution. Officials of people’s government organs should possess a high degree of Party spirit and revolutionary principle and conduct their work in a daring and active manner with the attitude that they are fully responsible for it. Courage and activeness arise out of trust in the Party, whereas timidity and acts of basing their actions on how people look at them result from lack of trust in the Party. Officials of people’s government organs should definitely root out passive approaches of expediting their work only when the Party throws its full weight behind them, and cherish an unyielding revolutionary work style of carrying through the task set by the Party even though their bodies are torn to pieces. They should constantly cultivate abilities for conceiving, organizing, supervising, guiding and developing their work to become versatile workers who are capable of implementing any tasks with credit. They should acquire our Party’s methods of mass work, set personal examples in all undertakings and make tireless efforts for the good of the people. Cherishing deep in their hearts the true meaning of our Party’s affection for the people, they should be infinitely courteous to them and become their faithful servants, always sharing weal and woe with them and working with devotion for them. At present, our historic struggle for national reunification, a long-cherished desire of the nation, has entered a new phase. We have taken momentous measures in succession to improve inter-Korean relations and ensure peace on the Korean peninsula with a firm resolve to achieve without fail the cause of national reunification, into which the great Comrades Kim Il Sung and Kim Jong Il put their heart and soul all their life. Last year we held three rounds of historic north-south summit meetings and talks and adopted inter-Korean declarations to bring about a dramatic turn in the relationship. They were events of great significance which turned around the grave situation that was teetering on the brink of war every moment and which heralded the start of a new journey to national reunification. Now the entire nation ardently hopes that the historic Panmunjom Declaration and the September Pyongyang Joint Declaration will thoroughly be implemented so that the peaceful atmosphere on the Korean peninsula will continue and inter-Korean relations will improve uninterruptedly. The south Korean conservative forces, however, are responding to the aspirations of the nation and the unanimous expectations of the international community with too perfidious words and behaviours, and are struggling to bring inter-Korean relations back to those in the period before the publication of the Panmunjom Declaration. The United States openly forces “speed adjustment” on the south Korean authorities and tries in every way to subordinate the implementation of inter-Korean agreements to its anti-DPRK policy marked by sanctions and pressure. As a result, a grave situation has been created for us to decide whether to ease the tension on the Korean peninsula and continuously carry on the atmosphere of inter-Korean rapprochement or to return to the past when the tension spiralled up towards a catastrophe with the danger of war looming larger. We cannot look on with folded arms the current situation which causes serious concern over the destiny and future of the nation and peace and security in the region, but we have to take proactive measures without delay to straighten it out in line with the unanimous aspirations of all the fellow countrymen. To this end, it is needed above all to take a proper stand and attitude with which to invariably adhere to and implement the inter-Korean declarations encapsulating the unanimous will of the nation, whatever difficulties and obstacles in the way. I would like to make it clear once again that as I already declared, it is my firm determination to turn, together with the south Korean authorities, inter-Korean relations into a lasting and durable relationship of reconciliation and cooperation and write a new history of the nation that achieves peace and co-prosperity as desired by all the countrymen. In order to untangle the prevailing unsavoury situation, heighten the good atmosphere for improved relations north and south created with much effort and make it bear meaningful fruit of peace and reunification, it is important to put an end to big-power worship marring the spirit of independence and to the policy of dependence on foreign forces encroaching upon the common interests of the nation, and subordinate everything to the improvement of the relations. I think that if the south Korean authorities truly want improved relations, peace and reunification, they should come back to the original intention they had at the time of the Panmunjom summit and the September Pyongyang summit and fulfil the responsibility they have assumed before the nation through the sincere implementation of the north-south declarations. They should not waver in their attitude as they see the tide nor pose as a meddlesome “mediator” and “facilitator” as they busy themselves with foreign trips, but be a responsible party that defends the interests of the nation speaking what they have to say squarely with the mind of their own as members of the nation. It is our consistent assertion that it is imperative to smash the underhand schemes of the hostile anti-reunification and anti-peace forces within and without in order to sustain the atmosphere of improved inter-Korean relations. It is needed to realize before it is too late that neither progress in inter-Korean relations nor any fruit of peace and prosperity can be expected if the hawkish forces in the south Korean military, who persist in veiled hostility as they resume the military exercises, which were agreed before to be discontinued, jointly with the United States by changing their names, continue to be allowed to make reckless moves, and unless the anachronistic arrogance and hostile policy of the United States, which is creating artificial obstacles in the way of improved relationship as it presents its arbitrary outrageous demand, are eradicated. All the fellow countrymen in north and south and abroad should, staking the destiny and future of the nation, resolutely check and foil the moves of the United States and south Korean conservative forces that go against the historic current towards improved inter-Korean relations and peaceful reunification. If they are truly willing to opt for the improvement of north-south relations, peace and reunification, the south Korean authorities should sympathize with our stand and will, keep pace with us and make a courageous decision to show their sincerity by practical action, not by words. Our Party and the government of our Republic will continue to make sincere and persevering efforts to achieve the sustained development of north-south relations and peaceful reunification of the country, solemnly cherishing the aspirations and desires of the nation in the future, too. The first-ever DPRK-US summit meeting and talks, which were held in Singapore in June last year under the world’s spotlight, were a momentous occasion that brought the hope of settlement of peace to the Korean peninsula where fire had been exchanged; and the June 12 DPRK-US Joint Statement was a historic declaration announcing to the world that the two countries which had been hostile to each other from one century into the next would write a new history of relationship, and therefore it won full support and approval of the international community aspiring to peace. The DPRK voluntarily took crucial and significant measures including the discontinuation of nuclear test and test-fire of intercontinental ballistic missile, thereby taking the first step towards confidence-building which is the main key to the removal of bilateral hostile relations, and it also took the broadminded measure of realizing the repatriation of the remains of US soldiers, which had been requested by the US President, as a show of its will to sincerely implement the June 12 DPRK-US Joint Statement which serves as a milestone in the establishment of a new bilateral relationship. However, the second DPRK-US summit talks held in Hanoi last February raised strong questions about whether the steps we took under our strategic, courageous decision were right, and they were an occasion that gave us a sense of caution about whether the United States is genuinely interested in improving the bilateral relations. At the talks we expressed our resolve to set the essential stages and course to be followed without fail for the implementation of the June 12 DPRK-US Joint Statement in the interests of both sides and to take more prudent and trustworthy steps, and looked forward to a positive response of the United States. But the United States came to the negotiating table after thinking only about completely unrealizable methods. In other words, they were unprepared to solve problems with us at the table and they had no definite orientation or methodology. By that sort of thinking, the United States will not be able to move us one iota nor get what it wants at all, even if it sits with us a hundred times, a thousand times. It has recently conducted a test for simulated interception of our intercontinental ballistic missile and resumed military exercises the US President committed himself to suspending, while making other hostile moves contrary to the spirit of the June 12 Joint Statement in a more undisguised way. These seriously get on our nerves. I am very displeased with such a trend. As waves rise when wind blows, the more pronounced the US policy hostile towards the DPRK becomes, the tougher our counteraction will become. Although it strongly hints at the settlement of issues through dialogue as it thinks about the third round of DPRK-US summit talks, the United States still looks away from the withdrawal of its hostile policy, the basic way for establishing a new bilateral relationship; rather it mistakenly believes that if it pressures us to the maximum, it can subdue us. We, of course, attach importance to the settlement of issues through dialogue and negotiations, but the US-style dialogue of unilaterally pushing its demands does not fit us, nor are we interested in it. Though the United States calls for a negotiated settlement of issues, it is stirring up hostility to us day after day, which is an act that is as foolish and risky as an attempt to put out fire with oil. Given the deep-rooted animosity between the DPRK and the United States, in order to implement the June 12 Joint Statement both sides should give up their unilateral terms and seek a constructive solution that meets each other’s interests. To this end, it is needed above all for the United States to approach us with a new way of calculation after putting aside the current one. The United States is talking much about holding the third round of bilateral summit talks, but we are neither pleased nor willing to see summit talks like the Hanoi summit talks re-enacted. However, as President Trump continuously observes, personal relations between he and I are not hostile like the relationship between the two countries, and we still maintain good relations, and if we want, we can send and receive letters asking for each other’s regards any time. If the United States proposed holding the third round of summit talks after finding out with a proper attitude a methodology that can be shared with us, we would be willing to try one more time. But in my opinion at this moment, it comes to my mind that there is no need for me to obsess over the summit talks with the United States out of thirst for the lifting of sanctions. Anyway, we will be patient and wait till the end of this year to see whether the United States makes a courageous decision or not, but it will obviously be hard to get a good opportunity like the last time again. In future, I will put my signature on an agreement without hesitation only when it contains fair clauses which conform to the interests of both sides and which are acceptable to them, and this depends entirely on the stand the United States takes and the way of calculation it comes up with. What is obvious is that if it sticks to its current political way of calculation, the prospects for problem solving will be bleak and very dangerous. At this crucial time, I hope that the United States will make a well-advised judgment and the second hand of the clock of the DPRK-US showdown which they stopped with so much difficulty will not move again for all ages. The government of the Republic will strengthen and develop the bonds of friendship and cooperation with all the countries of the world that respect the sovereignty of our country and are friendly to it, and will advance hand in hand with all the peace-loving forces of the world to establish a lasting and durable peace mechanism on the Korean peninsula. As I have just said, I will no longer set my heart on such a trivial issue as lifting sanctions by the hostile forces, but open up the way to prosperity by our own efforts. Although the goal of our struggle is demanding and challenges and difficulties stand in the way of our socialist construction as ever, our Party and the government of our Republic are steadfast in their will to open a new phase of prosperity and achieve the ideal and goal of building a powerful country by their own efforts under the unfurled banner of Kimilsungism-Kimjongilism. The road of independence leads to prosperity and victory. Nothing can reverse or stop the dynamic advance of our State and people that have unshakable faith and will to pave their own way by themselves with confidence in their own strength. Their website is being a little difficult at the moment — will add the Korean version as well when possible. The 9th plenary meeting of the 13th Presidium of the Supreme People’s Assembly (SPA) of the DPRK took place at the Mansudae Assembly Hall Wednesday. The plenary meeting was attended by members of the SPA Presidium. Officials concerned were present there as observers. Discussed at the meeting were review of the implementation of the state budget for Juche 104 (2015) of the DPRK and the state budget for Juche 105 (2016). A report was made at the meeting. According to the report, the state budget for last year was correctly carried out. The plan for state budgetary revenue was over-fulfilled 1.3 percent or an increase of 5 percent over the previous year. The plan for local budgetary revenue was fulfilled at 113.8 percent while that for state budgetary expenditure was carried out at 99.9 percent. 15.9 percent of the total expenditure was allocated for national defence while 47.5 percent for building an economic power and the improvement of the standard of people’s living. Investment in the fields of science and technology showed a 4.7 percent increase over that last year. 36.6 percent of the total expenditure was earmarked for cultural construction including education, public health, sports and literature and arts. The state budgetary revenue for this year is expected to go up 4.1 percent out of which transaction revenue will hold 3.3 percent, the revenue from the profits of state enterprises 4.5 percent, the revenue from the profits of cooperative enterprises 1.5 percent, that from real estate rent 4 percent, that from social insurance 1.1 percent, that from the sale of properties and price difference 2.5 percent and other revenue 1.3 percent. The revenue from economic trade zone is expected to grow 4.1 percent. Out of the state budgetary revenue the national budgetary revenue will account for 76.8 percent while that from local areas 23.2 percent. The state budgetary expenditure is expected to go up 5.6 percent over last year out of which 4.8 percent will go to industries, 4.3 percent to agriculture, 6.9 percent to fisheries, 13.7 percent to capital construction and 7.5 percent to forestry. It was decided to increase expenditure in the field of science and technology 5.2 percent, the field of education 8.1 percent, the field of public health 3.8 percent, the field of sports 4.1 percent and the field of culture 7.4 percent. 15.8 percent of the total expenditure will be spent for national defence. A large amount of educational aid fund and stipends will be sent for the education of Korean children in Japan. A decision of the Presidium of the SPA “On approving the review of the fulfillment of the Juche 104 (2015) state budget of the DPRK” and a decree of the Presidium of the SPA “On the Juche 105 (2016) state budget of the DPRK” were adopted at the meeting. Constituencies and sub-constituencies for the election of deputies to the provincial (municipal), city (district) and county people’s assemblies have displayed voter rolls on Saturday. The voter rolls were worked out, thoroughly pursuant to the Law on the Elections of Deputies to the People’s Assemblies at All Levels. Registered there are all citizens with suffrage residing in the relevant areas. The voters are confirming whether they are correctly registered. North Korea said Tuesday that it plans to select deputies to local assemblies in mid-July for the first time since the North’s leader Kim Jong-un took power in late 2011. Elections for deputies to provincial, city and county people’s assemblies will take place July 19, according to the North’s official Korean Central News Agency. The elections are held every four years, and the number of seats is determined by the population of each area. However, they are widely considered a formality as the candidates hand-picked by the ruling Workers’ Party are rubber-stamped into office. 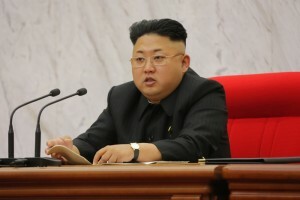 The latest local elections were held in July 2011 when Kim was the communist nation’s heir-apparent. Elected deputies hold a meeting once or twice every year to set their provinces’ budgets and draw up plans for law enforcement, experts said. At the Third Session of the 13th Supreme People’s Assembly (SPA) held on April 9, Premier Pak Pong Ju of the DPRK Cabinet delivered a progress report on the Cabinet’s performance for the previous year and goals for this year. He said, “High-temperature air-combustion technology and other technologies that do not require the use of heavy oil should be introduced into various fields of the national economy.” As North Korea is a non-oil producing country, such technology would be beneficial. But whether this technology is possible requires careful consideration. According to various state media reports, “high-temperature air-combustion technology” maintains the internal temperature of the furnace by combusting gas or liquid raw material into the air by heating it to high temperature, wherein high temperature needed at the time is acquired through the gasification of anthracite. Respectively, this technology is also called the high-temperature, air-combustion technology by the gasification of anthracite. This technique is known as energy-saving advanced technology that manages the thermal efficiency which greatly lowers the heat loss that occurs from the used gas discharge. This technology is characterized by its wide range of application that includes heating of the metal factory that uses heavy oil as fuel, as well as glass melting furnace, furnace refractories (or kilns), pottery baking furnace, and heat treatment furnace. For the production or heating of rolled steels, application of this technology allows for effective production without the use of heavy fuel oil. Accordingly, the Ministry of Metal Industry has begun to implement projects with major metal industry enterprises such as Kim Chaek Iron and Steel Complex, Hwanghae Iron and Steel Complex, and Chollima Steel Complex. This technology is being introduced into various enterprises including all steel production process and refractories that use heavy oil. In 2011, North Korea emphasized “vanguard technological breakthroughs” and constructed heating furnace equipped with high-temperature air combustion technology at the Kim Chaek Iron and Steel Complex for the commemoration of Kim Il Sung’s 100th birthday. It was widely publicized that introduction of this technology has put an end to the steel billets production system that uses heavy fuel oil. North Korea has drafted a budget that emphasizes improving the lives of its citizens and the establishment of an economic power this year. The state-run Korean Central News Agency (KCNA) reported that on April 9, 2015, North Korea held the 3rd Session of the 13th Supreme People’s Assembly (SPA), where authorities balanced accounts from last year’s spending and decided the budget for this year. “This year the state budget was designed to further strengthen the self-defense capabilities of national defense while putting technology firmly at the front and bringing about a transformation in the building of an economic powerhouse,” North Korea’s head of the Finance Ministry, Ki Kwang Ho, explained at the session. First, North Korea decided to raise the entire budget expenditures over last year by 5.5 percent to celebrate the 70th anniversary this October of the establishment of the Worker’s Party of Korea (WPK). This year the national defense expenditures represent 15.9 percent of the budget, the same as last year. Meanwhile, authorities decided to increase investment in the technology sector over last year by 5 percent. The following areas were also increased over last year: forestry (9.6 percent), basic construction (8.7 percent), physical education (6.9 percent), education (6.3 percent), culture (6.2 percent), general industry and light industry (5.1 percent), fisheries (6.8 percent), agriculture (4.2 percent) and health (4.1 percent). North Korea, however, did not disclose the full amount of the budget. Based on the budget, it is predicted that North Korea will concentrate state management this year on improving the people’s quality of life. In his New Year’s address, First Chairman Kim Jong Un intimated his intentions to better the lives of the people through economic reform this year. “We need to solve the people’s food issue through the three axes of agriculture, livestock and fisheries and bring the food situation to the next level […] We need to encourage businesses to be proactive and creative to take the lead in business activities,” he proclaimed in his address. The Third Session of the 13th Supreme People’s Assembly (SPA) of the DPRK took place at the Mansudae Assembly Hall Thursday. Present there were deputies to the SPA. Present there as observers were officials of the party, armed forces and power organs, social organizations, ministries and national institutions and those in the fields of science, education, literature and art, public health and media. The participants observed a moment’s silence in memory of President Kim Il Sung and leader Kim Jong Il, founder and builder and eternal leaders of the DPRK. Discussed at the session were “1. On the work of the DPRK Cabinet for Juche 103 (2014) and its tasks for Juche 104 (2015)”, “2. On summing up the fulfillment of the state budget of the DPRK for Juche 103 (2014) and its state budget for Juche 104 (2015)” and “3. Organizational matters”. Deputy Pak Pong Ju, premier of the Cabinet, made a report on the first agenda item. He said that last year the DPRK registered great successes in grain production, provided a guarantee for completing the stock-breeding base in Sepho area as a gift to the 70th anniversary of the founding of the Workers’ Party of Korea and built many monumental structures, icons of Juche architecture, through army-people coordinated operations. It opened up a bright prospect for implementing the behests of Kim Jong Il on turning the Chongchon River into one of treasure and patriotism, made progress in developing economy and improving the people’s living standard by dint of science and technology and made great achievements in the fields of sports, education and public health, he noted. It is the main tasks for this year to settle the food problem of the people with the farming, stock-breeding and fishery as the three thrusts, boost electricity production and put the metal industry on a Juche basis while taking it as the lifeline and key point to carry out the behests of Kim Jong Il and pushing forward them consistently, he said, referring to the concrete tasks. Deputy Ki Kwang Ho made a report on the second agenda item. The plan of state budgetary revenue for last year was over-fulfilled 1.6 percent, 6 percent increase over the previous year, the plan for state budgetary expenditure was carried out at 99.9 percent, and 46.7 percent of the total state budgetary expenditure was spent for the development of the national economy, 37.2 percent for the cultural field and 15.9 percent for national defence, he said. The state budgetary revenue for this year will grow 3.7 percent over last year. The state budgetary expenditure for this year will grow 5.5 percent over last year, 15.9 percent of total budgetary expenditure will be spent for national defence and bigger investment will be made to shore up the national economy and to improve the people’s living standard, he said. Speakers said that the work of the Cabinet and the fulfillment of the state budget for last year have been reviewed correctly, clear-cut tasks for this year for improving the standard of people’s living and building an economic power have been advanced and the state budget was properly shaped to fully display the advantages of the socialist system. They expressed full support and approval of them. They evinced the pledge to consolidate the political and military might of the country in every way, bring about fresh progress in all spheres of socialist construction and thus mark the 70th anniversaries of the WPK founding and the liberation of Korea as grand festivals of victors. The session adopted a decision of the SPA of the DPRK “On approving the report on the work of the DPRK Cabinet and the summing up of the fulfillment of the state budget for Juche 103 (2014)” and an ordinance of the SPA of the DPRK “On the state budget of the DPRK for Juche 104 (2015)”. Deputy Pak To Chun was recalled from member of the DPRK National Defence Commission due to his transfer to other post. Deputy Kim Chun Sop was elected member of the DPRK NDC to fill a vacancy upon the authorization of Marshal Kim Jong Un. Deputy Pak Pong Ju, premier of the Cabinet, delivered a report on the work done by the Cabinet last year and tasks facing it this year at the Third Session of the 13th Supreme People’s Assembly (SPA) of the DPRK Thursday. According to the report, last year was a year of shining victories as the foundation for winning a final victory in all fields of building a thriving nation was consolidated and invincible might of Juche Korea was strikingly demonstrated under the wise leadership of Marshal Kim Jong Un. Farming materials including chemical fertilizers, rice-seedling transplanting machines, mobile threshing machines, farm machine parts and oil were provided as planned last year, true to the intention of the party which set the agricultural field as a key field in the drive of pushing forward economic construction and improving the standard of people’s living and an outpost of defending socialism. Pasture covering 50 000 hectares was created in the Sepho area and the work of securing livestock was pushed ahead simultaneously with the construction of structures and preparations for their operation to provide a guarantee for completing the stock-breeding base in Sepho area as a gift to the 70th anniversary of the Workers’ Party of Korea. The Wisong residential district for scientists, Yonphung Rest Home for Scientists, Pyongyang Orphanage and Baby Home and lots of other monumental structures were built as icons of Juche-based architecture. More than 1 000 valuable scientific and technological development projects were carried out. The coal industry showed 28 percent increase in production over last year. The production of cement jumped 12 percent over last year and that of various industrial indices including nitrogen fertilizer, salt and timber also went up. Players of the DPRK bagged many gold medals at the 17th Asian Games and other international sports events, demonstrating the honor of the country. The popular policies of the party were implemented at a higher level in the fields of education and public health. Referring to the tasks for this year, he stressed the need to consistently hold fast to the implementation of the behests of leader Kim Jong Il as a lifeline and the most important work. The main thrusts for this year are to organize the economic work with a main emphasis on solving the food problem of the people with agriculture, stock-breeding and fisheries as the three pivots, drastically increasing power production and putting metal industry on Juche basis, the reporter said. He called for improving the production environment of the units associated with the leadership feats of President Kim Il Sung and Kim Jong Il and steadily raising their modernization level so as to continue glorifying their undying feats. It is important to thoroughly carry out the party’s strategic line on simultaneously developing economic construction and the building of a nuclear force and provide equipment, raw materials and funds necessary for the combat readiness of the People’s Army and the defence industry in a responsible manner and thus actively contribute to bolstering up the defence capabilities. Investment in the field of science and technology should be increased and efforts be concentrated on solving scientific and technological problems urgently required by reality including key state projects for the development of science and technology. Scientific farming methods should be actively introduced into the agricultural field and drive of securing and saving water should be conducted and such farming materials as chemical fertilizers, rice seedling transplanting machines, rolled steel, farm machine parts and oil be satisfactorily provided. Ministries, national institutions and provincial people’s committees should complete flawlessly and qualitatively the construction of dwelling houses, pens of domestic animals, public buildings, pavement of roads and creation of windbreaks by the 70th anniversary of the WPK. The management of modern stock-breeding bases, fish breeding bases, greenhouses and mushroom production bases in different parts of the country should be put on normal footing and production be boosted there. In the fisheries field fishing boats and fishing tackle should be modernized and scientific fishing methods be actively introduced to haul fishes all the year round. In the field of light industry, local supply of raw and other materials should be actively pushed forward and their production be markedly boosted to provide the people with more consumer goods. A decisive measure should be taken to provide equipment and materials needed for thermal power plants and coal mines on a top priority basis. The power stations in tiers on the River Chongchon, Paektusan Songun Youth Power Station, Ryesonggang Power Station, Orangchon Power Station and other hydroelectric power stations that were planned by Kim Jong Il should be completed in a short span of time. Efforts should be focused on further rounding off the work of putting metal industry on a Juche basis. In the chemical industrial field, production should be put on a normal footing at Juche fertilizer and Juche fiber production bases. High temperature air combustion technology and other technologies that do not require the use of heavy oil should be introduced into various fields of the national economy. Sustained great efforts should be directed to reenergizing the production in the vanguard sectors and key industries of the national economy such as railway transport, mining, forestry and machine-building industry. All the fields and units should turn out in the drive of restoring forests and work hard to turn the mountains of the country into those in thick verdure full of nuts and fruits. Substantial work should be conducted to turn Pyongyang into the hub and model of Songun culture and a world class city and to spruce up provincial, city and county seats so that they may preserve their local characteristics. The work to drastically improve education in the new century should be actively pushed forward, enthusiasm for sports should be raised higher and lots of fine literary pieces be created to encourage all people in the general offensive for glorifying the grand October festivals. The reporter called on all the officials in the field of economic guidance to thoroughly carry out the important tasks set forth by Kim Jong Un in the New Year Address and at the enlarged meeting of the Political Bureau of the Central Committee of the Workers’ Party of Korea and fulfill their responsibilities and duties in the general offensive this year marking the 70th anniversaries of the WPK and the liberation of Korea. Deputy Ki Kwang Ho, minister of Finance, made a report on the review of the fulfillment of the state budget of the DPRK for Juche 103 (2014) and the state budget for Juche 104 (2015) at the Third Session of the 13th Supreme People’s Assembly on Thursday. According to the report, the plan of state budgetary revenue for last year was over-fulfilled 1.6 percent, 6 percent increase over the previous year. The local plan for budgetary revenue was carried out at 122.2 percent and the plan for state budgetary expenditure at 99.9 percent. 46.7 percent of the total budget was spent for the development of the national economy. 37.2 percent of the total state budgetary expenditure was spent for the cultural field including education, public health, sports and literature and art. 15.9 percent of total expenditure was directed to national defence. The state budgetary revenue and expenditure for this year have been shaped in such a way as to bolster up the capabilities for self-defence and effect a turn in building a socialist economic power and a highly civilized nation by giving definite precedence to science and technology. The state budgetary revenue will grow 3.7 percent over last year; transaction revenue is expected to swell 2. 6 percent, revenue from the profits of state enterprises 4.3 percent, revenue from the profits of cooperative organizations 3. 2 percent, real estate rent 0.7 percent, social insurance fee 2.8 percent, revenue from sale of properties and price differential 1.4 percent, revenue from other sources 0.8 percent and revenue from economic trade zones 3.6 percent. The national budgetary revenue will account for 79 percent and the local budgetary revenue 21 percent of the state budgetary revenue. Provinces, cities and counties are expected to ensure expenditure with the revenue from local sources and provide profits to the national budget. The national budgetary expenditure is expected to grow 5.5 percent over last year for focusing investment in augmenting the national power, developing science and technology and undertaking the projects for fulfilling the grandiose plan of the party so as to financially guarantee the general advance for greeting the grand October festival with labor achievements. 15.9 percent of total expenditure will be spent for national defence. The allocation of funds for the field of science and technology is expected to go up 5 percent. 4.2 percent more financial disbursement will be made for the agricultural field, 6.8 percent more for the fisheries field, 5.1 percent more for the industrial field including light industry and vanguard fields of the national economy, 8.7 percent more for capital construction and 9.6 percent for the forestry field to shore up the national economy as a whole, bring about a turn in improving the people’s living standard and wage a dynamic drive for the building of monumental edifices and reforestation. Expenditure for education goes up 6.3 percent, that for public health 4.1 percent, that for sports 6.9 percent and that for culture 6.2 percent so as to provide a financial guarantee for the drive for bringing about a turn in building a highly civilized socialist state. A large amount of funds will be sent as educational aid fund and stipends for the children of Koreans in Japan this year, too. The reporter stressed that the Korean people faced with huge tasks this year but the DPRK is sure to emerge victorious as there are the tested and seasoned leadership of the Workers’ Party of Korea, invincible revolutionary spirit and fighting spirit and the army and people full of revolutionary and patriotic enthusiasm. 1. 38 North offers analysis by Ruediger Frank and Alexandre Mansourov. 2. The Institute for Far Eastern Studies (IFES) offered two reports. 3. Here is coverage in the Daily NK. 4. Here is coverage in Yonhap. Coinciding with the promotion of the nation’s economic development zones (EDZs), North Korea has recently decided to adopt three new regulations, including the “Democratic People’s Republic of Korea’s Operation Regulation of Economic Development Zone Management,” which opens up high-level positions in management organizations to foreigners within the various EDZs around the nation. The three new regulations, including the “DPRK Operation Regulation of EDZ Management,” “DPRK EDZ Establishment Regulation” and the “DPRK EDZ Company Establishment Operation Regulation” were obtained and reported by the Maeil Business Newspaper on November 4, 2014 and were said to be adopted by the Standing Committee of the Supreme People’s Assembly just two days later on November 6. In May 2013, North Korea established the legislative basis for the creation of central-level EDZs (special economic zones, SEZs) and provincial-level economic development zones, and in October, the State Economic Development Board had its status elevated to the State Economic Development Committee and was given total control over business in EDZs. Then, on November 21, the Sinuiju Special Economic Zone (SEZ) was announced alongside thirteen other provincial-level EDZs. The following year, in June 2014, the Wonsan-Mt. Kumgang International Tourist Zone was announced, followed by the July announcement about the designation of six additional economic development zones, including the Unjong Cutting-Edge Technological Development Zone. With regards to the regulation on the operation of management agencies in EDZs, it was reported that “management operation at EDZs will be conducted by the EDZ’s Management Operation Association or Management Office (hereafter Management Agency).” Specifically, the regulation states, “Members of the Management Agency may be a person from [the DPRK] or another country who has extensive business experience and who possesses expert knowledge in their field,” showing that foreigners may now be entrusted with high-level positions such as chairman in North Korea’s economic development zones. Furthermore, it was decided that “foreign and/or domestic experts may be invited to work full time or part time in their appropriate department according to the needs of the Management Agency,” stipulating that foreign experts outside of EDZ managerial positions may also be invited. In terms of the regulation on the establishment and operation of corporations in EDZs, it was decided that “foreign corporations, individuals, economic organizations and overseas Koreans may invest in EDZs and establish and operate companies through joint ventures or individually.” The regulation also states, “Investment and economic activities are limited only to those who give knowledge to and promote the nation’s safety, the health of the people, a wholesome, socially moral lifestyle and environmental protection, and are prohibited to those who are lagging behind in terms of economic technology.” Instead, the regulation promotes the establishment of companies in the “infrastructure construction and cutting-edge technology sectors,” and has clearly stated that they will receive preferential treatment in the form of tax cuts, favorable land use conditions and other benefits. Additionally, while the regulation did say that “companies must primarily employ labor from [the DPRK],” it held the door open for foreigners by saying that “a portion of management personnel, specific types of occupational experts and technicians may be employed from other countries.” The regulation also set specific standards for penalties should a company create problems. Businesses caught operating without a business registration or license will face charges between ten and fifteen thousand Euro, businesses who fail to report changes in their company registration will face fines between two thousand and five thousand Euro, and business founders who are caught pocketing investment money without lawful justification will suffer fines between ten and twenty thousand Euro. 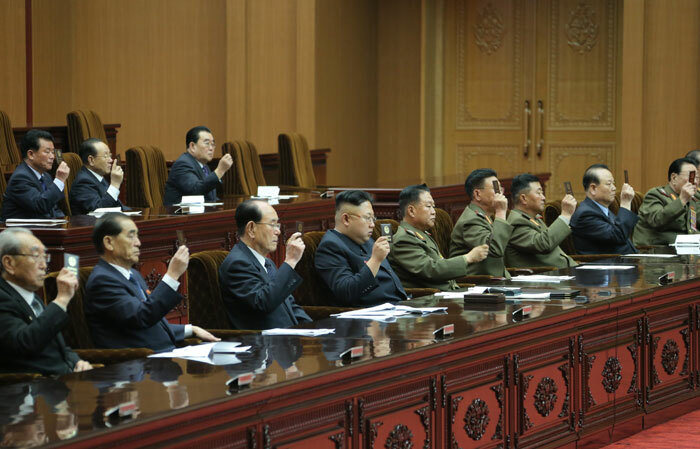 UPDATE 3 (2014-9-25): Kim Jong-un did not attend the SPA meeting. North Korea’s young leader wasn’t in his customary seat as the country convened its rubber-stamp parliament Thursday, adding to South Korean media speculation that Kim Jong Un may be ill.
Only part of the meeting of the Supreme People’s Assembly was shown on state TV, but Mr. Kim wasn’t present and apparently missed the meeting for the first time since he took power after the death of his father Kim Jong Il in December 2011, according to an official for the South’s Unification Ministry who spoke on condition of anonymity because of office rules. The usually ubiquitous Mr. Kim, the third member of his family to rule the country, hasn’t been seen in state media since attending a Pyongyang concert on Sept. 3. He was shown limping on television in July and again earlier this month, and South Korean media have speculated that Kim has been ill, although there has been no discussion of the absence in the North’s state-run media. Kim, who is considerably overweight, has not featured in state media broadcasts since appearing at a concert alongside his wife and former state entertainer Ri Sol Ju this month. In July, he was seen walking with a limp at an event with key officials. But analysts warned against reading too much into Kim’s absence. It recalled Deputy Choe Ryong Hae from the post of vice-chairman of the National Defence Commission (NDC) of the DPRK due to his transfer to other post and Deputy Jang Jong Nam from the post of member of the NDC of the DPRK due to his transfer to other post. It elected Deputy Hwang Pyong So to fill the vacancy as vice-chairman of the NDC of the DPRK and Deputies Hyon Yong Chol and Ri Pyong Chol to fill the vacancy as members of the NDC of the DPRK at the proposal of Marshal Kim Jong Un. This list of NDC members (as of October 2013 )can be found here. At the meeting, state media said, Choe Ryong Hae had been removed from the post of vice chairman of the National Defence Commission, a body chaired by Kim, and was replaced by Hwang Pyong So. Hwang is a member of a powerful faction created in the 1970s under former leader Kim Jong Il, the father of the current leader, to boost a personality cult around his family. “Hwang’s appointment as NDC Vice Chairman shows that he has truly risen to become the regime’s de facto number two official,” said Michael Madden, a North Korean leadership expert and contributor to the 38 North website. Hwang was appointed “according to the wishes of Marshall Kim Jong Un”, the North’s official KCNA news agency said. 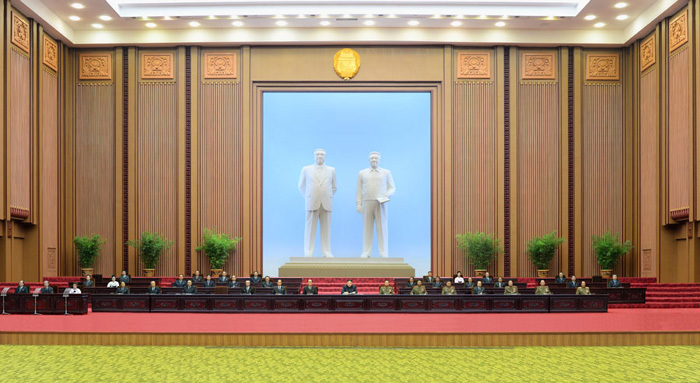 Pyongyang, September 25 (KCNA) — The 2nd Session of the 13th Supreme People’s Assembly (SPA) of the DPRK was held at the Mansudae Assembly Hall Thursday. Officials of the party, armed forces and power organs, public organizations, ministries, national institutions and the fields of science, education, literature and art, public health and media attended it as observers. All the participants observed a moment’s silence in memory of President Kim Il Sung and leader Kim Jong Il. SPA Chairman Choe Thae Bok made an opening address. The session discussed agenda items on summing up the implementation of “On Enforcing Universal 12-Year Compulsory Education”, the Ordinance of the SPA of the DPRK, and an organizational matter. The reporter said that the 6th Session of the 12th SPA held in September, Juche 101 (2012) promulgated Ordinance on Enforcing Universal 12-Year Compulsory Education in line with the new requirements of the developing revolution. According to the report, a work for successfully enforcing the schooling has been dynamically pushed forward as the one involving the whole state, all people and the whole society and signal successes have been made in it. The work for operating the six-year secondary schools by dividing them into three-year junior secondary schools and three-year senior secondary schools has been wound up in a brief span of time. The first phase programs for the universal 12-year compulsory education were worked out in a matter of one and half years and textbooks of new contents and style were compiled. Expenditure has been increased in educational field at the state budget, the State Planning Commission, the Ministry of Finance, provincial people’s committees and relevant institutions have ensured funds needed for educational work as planned, thus strengthening the material and technological foundation of schools. Over the past two years since the promulgation of the ordinance new classrooms have been built or constructed on an expansion basis at schools across the country and many school things produced. The reporter referred to the tasks facing the field of education. He underlined the need to build well the ranks of teachers and decisively raise their qualifications and roles. The general senior secondary schools should teach students with main emphasis on general secondary knowledge and senior secondary technical schools should make preparations in a responsible manner for giving education in basic technology to suit the economic and geographical peculiarities of the relevant areas while giving general education in conformity with the operation of senior secondary technical schools, new type schooling, on a trial basis, he noted. He also underlined the need to positively push ahead with the work for putting the nation’s universal general secondary education including genius education on a new high stage, reinforce the research forces at educational and scientific research institutions and increase their responsibilities and roles. He called for improving the conditions and environment for education to be fit for the appearance of a highly civilized socialist country. Speakers at the session renewed their resolution to decisively improve the quality of education to meet the realistic requirements of the developing education in the age of knowledge-based economy and suit the trend of the world and thus train the younger generation as more dependable revolutionary talents of Juche type equipped with perfect general secondary knowledge, modern basic technological knowledge and creative ability. The session adopted “On Comprehensively Enforcing Universal 12-Year Compulsory Education and Decisively Improving Its Quality”, the Decision of the SPA of the DPRK. It discussed the second agenda item. A September 6, 2014 article in the Rodong Sinmun reported that First Chairman of the National Defence Commission Kim Jong Un has begun to usher in a “revolution in education for the new century” and emphasized the need to construct a “world power of socialist education in the 21st century” at the 13th National Meeting of Educators held on Sept. 5. At the meeting, Kim Jong Un’s work, entitled, “Let Us Make a Revolution in Education in the New Century to Glorify Our Country as the One of Education and a Power of Talents” was presented to participants. Kim Jong Un also stated, “The goal to be attained by the revolution in education in the new century is to turn the country into a power of socialist education in the 21st century by bringing up all school youth and children as reliable pillars for the building of a thriving nation and educating all the people to be well versed in science and technology.” To achieve this, Kim Jong Un emphasized that the “decisive strengthening” of secondary education is the fundamental link of the education revolution. Pyongyang, September 5 (KCNA) — The Second Session of the 13th Supreme People’s Assembly of the Democratic People’s Republic of Korea will be held in Pyongyang on September 25, Juche 103 (2014). A relevant decision of the Presidium of the Supreme People’s Assembly was promulgated on Sept. 4. Information on the first session of the 13th SPA can be found here. Information on the election of the 13th SPA can be found here. It is the norm for the SPA to convene each spring to carry out the core responsibilities of ratifying personnel changes and hearing budgetary reports. Two of the more noteworthy results of the meeting in April this year were then-Director of the KPA General Political Department Choe Ryong Hae being made a deputy in the National Defense Commission, and Ri Su Yong being handed the foreign affairs portfolio. Ri, a seasoned diplomat, is scheduled to speak to the UN General Assembly later this month. Conversely, second sessions do not occur every year as a matter of course; rather, they are convened when necessary for the accomplishment of Workers’ Party objectives. One such session convened on September 25th, 2012, for instance, resulted in wide-ranging changes to the state education system, most notably the addition of a 12th year of mandatory schooling. As a result, attention is set to focus on personnel shifts and the possibility of major policy announcements. UPDATE 3 (2014-4-23): Michael Madden and Ruediger Frank have published articles in 38 north analyzing the “election” results. The first session of the 13th Supreme People’s Assembly (SPA) held by the Kim Jong Un regime concluded on April 9, 2014 showing no major personnel changes within the Cabinet. The existing regime will continue to lead the North Korean economy, and their recent economic reform measures are expected to gain momentum. At this session, it was decided that North Korea will retain Prime Minister Pak Pong Ju as leader of the Cabinet, and that many of the other high-level officials will maintain their positions in economic affairs. It is therefore expected that the Kim Jong Un regime’s economic reform measures, such as the expansion of farmers’ authority (through the Subworkteam Management System), the construction of economic development zones (EDZs), and the system promoting the independent economic management of factories (and all other production facilities), will be implemented smoothly and stably. It is also expected that North Korea will ramp up the implementation of its economic management improvement measures due to their recent success, which exceeded the state’s expectations. This directly coincides with the decision to retain Pak Pong Ju as Premier, and is an effort to secure the stability, continuity and longevity of North Korean economic policy. Only three high-level officials in the economic department were replaced at this first session of the SPA: Han Yong Guk replaced Kim Kwang Yong as the forestry minister, Kim Chon Gyun replaced Paek Ryong Chon as the President of the Central Bank, and Ri Je Son was appointed as the Minister of Atomic Energy Industry. The Ministry of Atomic Energy Industry is presumed to be an expanded and reformed version of the General Bureau of Atomic Energy (GBAE), which previously operated as an entity under the Cabinet. Established in 2013 at the 7th session of the 12th SPA, the Ministry of Atomic Energy Industry is responsible for North Korea’s nuclear program, nuclear policy, and the “byungjin line”, a policy that emphasizes the parallel development of economy and nuclear weaponry. The newly appointed Ri Je Son has served as the General Director of the GBAE since 1997, and was the target of United Nations Security Council sanctions after North Korea’s second nuclear test in 2009. Han Yong Guk has risen up through the ranks in the forestry sector, and Kim Chon Gyun has previously served as both director and vice-president of the Central Bank of the DPRK. These small changes in Cabinet personnel do in fact signify efforts to maintain the stability of the nation’s economic policy, but the fact that these changes are so few in number also signifies that, after the execution of Jang Song Thaek, “re-shuffling” of personnel within the Cabinet had already taken place to some degree. Before his execution, Jang Song Thaek had influences on many ministries within the Cabinet, including the ministries of commerce, metal and coal industries, and the Cabinet’s Extractive Industries. 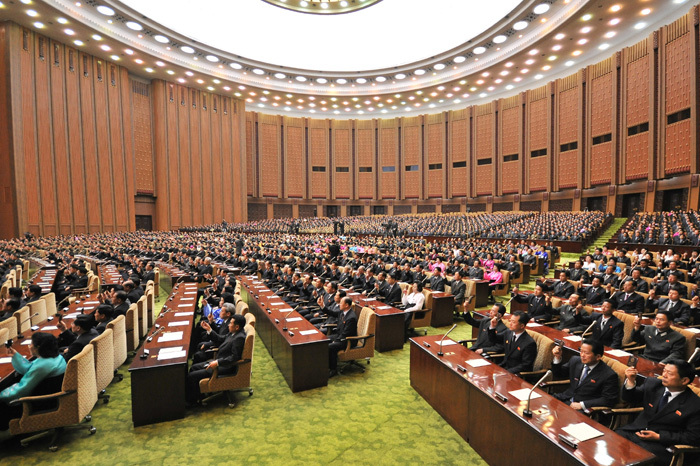 Since his execution, North Korea has replaced the head of these ministries. 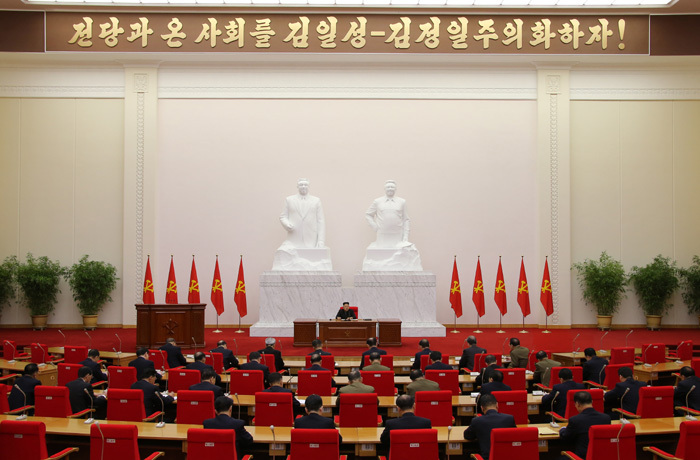 Story 1: 1st Session of 13th SPA of DPRK Held (KCNA) (PDF). Notes: Kim Jong-un elected as First Chairman of the NDC. State posts determined. One interesting agenda item was not elaborated on: “2. 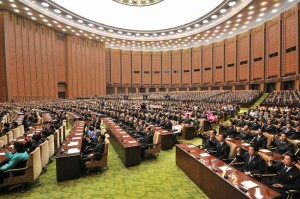 Election of the State Guidance Organ of the DPRK”. Members of the NDC Jang Jong Nam, Pak To Chun, Kim Won Hong, Choe Pu Il and Jo Chun Ryong. Choe Ryong-hae, a top military official, has become a truly influential figure second to only North Korean leader Kim Jong-un on April 9 when the newly launched North Korean parliament elected him as new vice chairman of the communist country’s most powerful body, National Defense Commission (NDC), during its first session. Choe, the director of the North Korean army’s General Political Bureau, took up the mighty post that had been kept vacant since Jang Song-thaek, a powerful uncle of the North Korean leader, was executed on treason charges in December. With his NDC appointment, Choe has grabbed all of the No. 2 positions of the North’s three core power bodies, the Political Bureau of the Workers’ Party’s Central Committee and the party’s Central Military Commission. Its Members Kim Yang Gon, Thae Jong Su, Jon Yong Nam, Hyon Sang Ju, Ri Myong Gil, Kim Jong Sun, Kim Wan Su, Ryu Mi Yong, Kang Myong Chol, Kang Su Rin and Jon Kyong Nam. Story 4: Members of DPRK Cabinet Appointed (KCNA) (PDF). Meanwhile, the North apparently opted for stability by making no dramatic changes in a Cabinet shakeup, which the parliament rubber-stamped during its session. The North’s octogenarian titular head of state, Kim Yong-nam, retained his position as president of the Presidium of the Supreme People’s Assembly, with Premier Pak Pong-ju also keeping his job. What is notable is that the North replaced its foreign minister. Ri Su-yong, a former ambassador to Switzerland, was named to replace Pak Ui-chun as the top diplomat of the communist country. Ri is known to have served as a guardian of leader Kim and his younger sister Kim Yo-jong when they studied at an international school in Switzerland in the 1990s. Pyongyang, April 9 (KCNA) — The 1st Session of the 13th Supreme People’s Assembly of the DPRK appointed Jang Pyong Gyu as director of the Supreme Public Prosecutors Office and elected Pak Myong Chol as president of the Supreme Court. Members Jang Pyong Gyu, Pak Myong Chol, Pak Thae Dok, Thae Hyong Chol, Cha Hui Rim and Pak Myong Guk. Members Pak Yong Ho, Kye Yong Sam, Hong So Hon, Kim Hui Suk, Choe Yong Il and Pak Hyong Ryol. The elected deputies to the SPA are the genuine people’s representatives who are devoting themselves to strengthening the DPRK government and accomplishing the revolutionary cause of Juche, remaining loyal to the idea and guidance of supreme leader Kim Jong Un. Among the SPA deputies are anti-Japanese revolutionary fighters who participated in the anti-Japanese armed struggle led by President Kim Il Sung and veterans of the Fatherland Liberation War. 17.2 percent of the deputies are service personnel who are performing shining feats at posts to defend the country and worksites to build a rich and powerful country, true to the Songun revolutionary leadership of Supreme Commander Kim Jong Un. Workers account for 12. 7 percent, cooperative farmers 11.1 percent and women 16.3 percent. They are bringing about shining labor innovations in the van of the heroic advance to build a thriving socialist nation. Also among the deputies are officials of the party and power bodies, administrative and economic organs and working people’s organizations, those in the fields of science, education, public health, literature and arts and media and various other sectors and those of the General Association of Korean Residents in Japan and organizations under it. Winners of Order of Kim Il Sung, Kim Il Sung Prize, Order of Kim Jong Il and Kim Jong Il Prize account for 30.2 percent, recipients of the titles of the DPRK hero and labor hero 14. 6 percent and recipients of academic degrees and titles including professors and doctors and scientists, technicians and experts 91.7 percent. 3.9 percent of the deputies are aged below 39, 66.9 percent 40-59, 29.2 percent above 60 and 94.2 percent of them graduated from universities or received similar level of education. Story 8: Report on Implementation of State Budget for 2013 and State Budget for 2014 (KCNA)(PDF). 16% of the total expenditure was spent for national defence, thus contributing to smashing the enemies’ reckless moves to ignite a nuclear war and the anti-DPRK confrontation racket and powerfully demonstrating the dignity and might of the DPRK. 45.2% of the total expenditure went to the field of economic construction to consolidate the foundation of the self-supporting economy, bring a surge in the production in various fields of the national economy including agriculture and usher in a heyday in construction. 38.8% of the total expenditure was spent for the field of cultural construction including education, healthcare, sports and music and arts, contributing to the enforcement of popular policies and the building of a highly-civilized socialist nation. This year’s state budgetary revenue and expenditure have been shaped in such a manner as to meet the financial needs for realizing the Party’s plan to build a thriving nation as early as possible and carrying out the national economy plan. The state budgetary revenue is expected to grow 4.3% over last year. Out of this, transaction revenue is expected to swell 4.5%, the revenue from the profits of state enterprises 7.9%, that from the profits of cooperative organizations 4.8%, that from real estate rent 9.5%, that from social insurance 5.1%, that from sale of properties and price differential 2.4%, other revenues 1.7% and the revenue from economic and trade zone 5.1%. This year’s state budget envisages that provinces, cities and counties will ensure the expenditure with their own incomes and deliver revenue to the national budget for their fulfillment of the plan for local budgetary revenue and expenditure. The state budgetary expenditure is expected to increase 6.5% over last year. Out of this, spending for the fields of agriculture, stockbreeding and fishery is expected to go up 5.1%, that for capital construction 4.3%, that for science and technology 3.6%, that for the vanguard sector of the national economy and the fields of basic industry and light industry 5.2%, that for education 5.6%, that for healthcare 2.2%, that for social insurance and social security 1.4%, that for sports 17.1% and that for culture 1.3%. 15.9% of the total state budgetary expenditure is expected to be spent for national defence this year and a huge amount of educational aid fund and stipends is to be sent to the children of Koreans in Japan. The last publicly available figure for Pyongyang’s annual budget, in 2008, was 451.3 billion North Korean won. Based on the latest available market rate, that would be roughly equivalent to $61.8 million. Using that figure to calculate spending on national defense would give a figure of around $8.65 million. 1. The Daily NK has an interview with a participant in the 12th SPA. 2. Here is 13th SPA “election” coverage. Pyongyang, April 8 (KCNA) — A meeting of the Political Bureau of the Central Committee of the Workers’ Party of Korea was held under the guidance of Kim Jong Un, first secretary of the Workers’ Party of Korea, first chairman of the National Defence Commission of the DPRK and supreme commander of the Korean People’s Army, on April 8. It was attended by members of the Presidium of the Political Bureau of the C.C., the WPK, and members and alternate members of the Political Bureau of the C.C., the WPK. Vice-premiers of the Cabinet and some department directors, first vice-department directors and vice-department directors of the C.C., the WPK were present at the meeting as observers. The meeting discussed the issue of reinforcing the organization for increasing the leadership role and function of the Party as required by the developing revolution. It discussed a proposal for forming the state leadership body to be submitted to the First Session of the 13th Supreme People’s Assembly. It also discussed an organizational matter. Decisions on the relevant agenda items were unanimously adopted at the meeting. Kim Jong Un at the meeting set forth important tasks to be fulfilled to further strengthen the WPK to be an invincible revolutionary party, firmly protect the dignity and sovereignty of the country and dynamically accelerate the work to improve the standard of the people’s living and the building of a rich and powerful country. 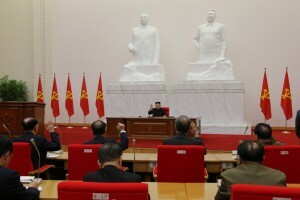 The meeting held under the guidance of Kim Jong Un marks a historic occasion that encouraged the service personnel and people in the struggle to dynamically advance along the road of independence, Songun and socialism under the uplifted banner of great Kimilsungism-Kimjongilism and provided an important milestone in bringing earlier the building of a thriving nation and a great revolutionary event of national reunification. Here is coverage in the Daily NK. You are currently browsing the archives for the Supreme Peoples Assembly category.